Authorities stepped up efforts to rescue those stranded there due to heavy rain while returning from the Kailash Mansarovar pilgrimage. The ordeal of the stranded Indian pilgrims returning from Kailash Mansarovar in Tibet is still not over as nearly 1,000 of them continue to await their evacuation at Nepal's mountainous regions amidst inclement weather, according to Indian embassy in Nepal. Over 250 Indian pilgrims were evacuated from Hilsa yesterday, as authorities stepped up efforts to rescue those stranded there due to heavy rain while returning from the Kailash Mansarovar pilgrimage. 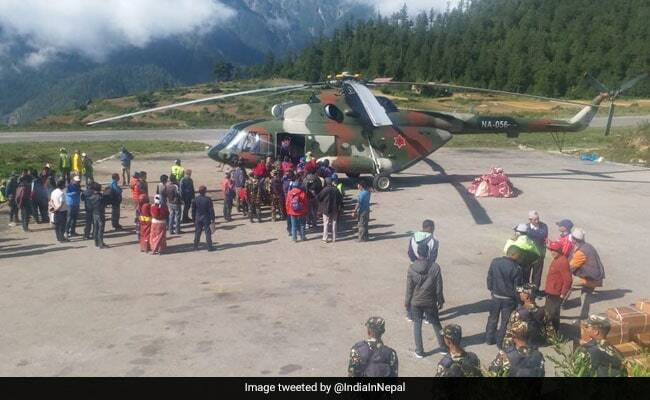 "As on 5 July morning 10 commercial flights operated taking 143 pilgrims from Simikot to Nepalgunj," the Indian embassy in Nepal said in a tweet. "According to the Embassy of India's official headcount, there are 643 people stranded in Simikot and 350 stranded in Hilsa. No casualty reported. It may be mentioned that the number of stranded pilgrims in resource lean Hilsa has been drastically brought down," the embassy tweeted. According to the District Police Office, hundreds of people are still at Simikot awaiting their flights. Inclement weather had disrupted the flights to and from the district until Monday, 'The Kathmandu Post' reported. Altitude sickness has become a major concern for those still waiting for their flights. Eight pilgrims have already died of altitude-related illness this year, the report said. Indian embassy in Nepal today issued a revised advisory for the prospective pilgrims. "Simikot and Hilsa in Nepal are extremely infrastructure lean places lacking basic medical, comfortable boarding and lodging facilities. Prospective pilgrims should get themselves medically examined before starting the Yatra as well as carry sufficient medicine for up to one month," it said. "Simikot and Hilsa are connected to rest of the world only by air. There is no other way of travelling in and out of these two places. These small aircrafts/helicopters can only operate subject to suitable weather conditions in these places and their adjoining areas, as the terrain and route is extremely dangerous," it added. The embassy has set up a hotline for pilgrims and their family members, which also comprises other language speaking staff for Tamil, Telugu, Kannada and Malayalam speakers. The pilgrimage to Kailash Mansarovar in Tibetan region of China is considered holy by Hindus, Buddhists and Jains. Every year, hundreds of Indians undertake the 'yatra' which involves trekking under inhospitable conditions.